That’s the usual response you get from people when they see an adaptation and I fully expected that after I had finished reading The Prestige I would feel the same way too. First a little disclaimer. 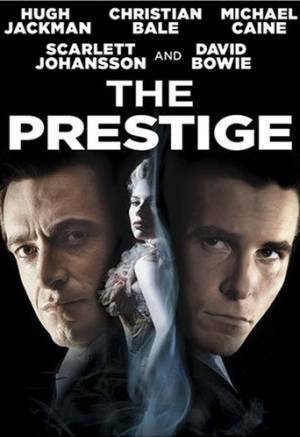 I LOVE The Prestige. It was directed by Christopher Nolan in between making Batman Begins and The Dark Knight and starring Batman and Wolverine (Christian Bale and Hugh Jackman) and I think it’s one of the most underated films to have come out in the last few years. I remember after watching it for the first time, Hilleke and I spent the next few weeks dissecting it, going over scenes and looking at them from every angle, trying to do that thing you do with any good magic trick, figure out how they did it. And The Prestige is very much a cinematic magic trick. It gives you a wonderful mystery and gives you the answer it wants to, while being filled with enough clues and misdirection to make you think that maybe you’ve been had, maybe there’s more going on here than I first thought. People have speculated that the entire film is in fact a trick played on the audience and while I don’t agree with that, I can see how some would come to that conclusion. Every time I sit down to watch the film I notice something new, a little wrinkle that adds to the mystery that I hadn’t see before and it makes me love it all the more. So a few weeks ago I sat down to read The Prestige by Christopher Priest, fully expecting to be even more blow away, sucked in and fooled by what I thought was going to be a literary magic trick. Now don’t take that the wrong way, I liked the book it but it’s not really on the same level as the film. I know that’s usually the reverse. Often so much detail and character interaction is lost when a book is translated to film that what you’re left with feels like a highlights package at best or at worst they completely miss the point of the book and ruin it. 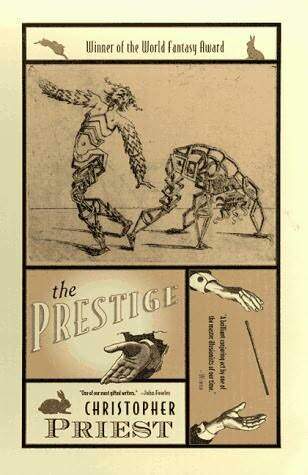 Now The Prestige book and film are very different. Jonothan and Christopher Nolan changed a lot when they wrote the screen play, from the structure to the ending, even down to the focus of the story ie the mystery of the trick “The Disappearing Man” but every change they made works and I think improves the story. For example. The book is structured in a very literal way. First we have Alfred Borden’s account of his life and then we have Robert Angier’s account of his. In both stories the other is presented as the bad guy and although it’s a fun plot device having the same events told from a different perspective, I often found that I had to flick back to Borden’s account of an event to remember what was happening. In the movie the two characters lives are presented together as one story. In typical Nolan fashion the movie jumps backwards and forwards in time while moving the narative forward. There are still 2 diaries but they are presented in a unique way. Borden is reading Angier’s diary and in it are passages about Angier reading Borden’s. In this way it keeps the two characters focussed on one another and shows much more clearly how their lives intertwined. Although they still see one another as the villain we get to see that in fact they are both as bad as one another… Or if we want to we can side with one over the other (I side with Borden, maybe because I prefer Batman over Wolverine). There are other examples, the characters in the book are very much 19th century gentlemen and the way they write about their lives is quite formal and it can be a little difficult to identify with them sometimes, whereas the characters in the movie are very “modern” and passionate (a film concession that is often out of of place I will admit). Characters in the book are also quite dissmissive of magic itself and the main trick in particular which I found to be a little strange for a book about magicians and magic. But the biggest change between the book and the movie is a whole subplot from the book that leads into a different ending. The subplot involves the present day descendants of Borden and Angier and their attempt to get to the bottom of the feud and solve a mystery of their own. I found this whole subplot a bit pointless and the ending it leads into, although it has a few scares, veers too far into the supernatural and gets a bit silly, which kind of ruins the whole book. I’m very glad this whole subplot was removed and the ending changed for the movie as I think the Nolan’s ending is vastly superior. I sound like I hated the book and while that’s not completely true, I do think the film is a lot better. I do wonder if I would feel the same if I’d read the book first. I like to think my opinion wouldn’t have differed too much though. My main problem with the book is that compared to the film, it seems to lack suspense and mystery. As I said the only real mystery is in the sublot and it’s resolution is, to put it frankly, dumb. Whereas the movie made the trick and it’s execution, first by Borden and then ultimately by Angier into the mystery. How did they do it? That’s the question that drives the film. How come this isn’t as good? Unfortunately that was often the question I had in mind while reading the book. This entry was posted in books, film review, films, Mike's reviews. Bookmark the permalink.